Movies about movies usually don’t quite get things right. The film business comes out looking more romantic and glamorous (or more corrupt and decadent) than it really is, and none of the human feeling of a movie set is communicated. 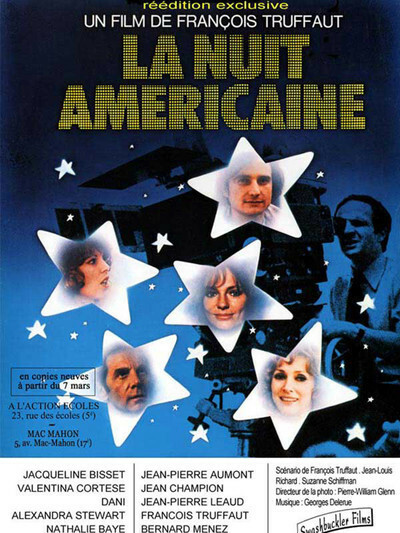 That is not the case with Francois Truffaut’s funny and touching film, “Day for Night,” which is not only the best movie ever made about the movies but is also a great entertainment. His cast includes a beautiful American actress (Jacqueline Bisset); an aging matinee idol (Jean-Pierre Aumont), and his former mistress, also past her prime (Valentina Cortese); the young, lovestruck male lead (Jean-Pierre Leaud), and the entire crew of script girls, camera operators, stunt men, and a henpecked production manager. (And if you have ever wondered what the key grip does in a movie, here’s your chance to find out.) Truffaut sets half a dozen stories in motion, and follows them all so effortlessly it’s almost as if we’re gossiping with him about his colleagues. The movie set is a microcosm: there is a pregnancy and a death; a love affair ended, another begun, and a third almost but not quite destroyed; and new careers to be nourished and old careers to be preserved. Truffaut was always a master of quiet comedy, and there are fine touches like the aging actress fortifying herself with booze and blaming her lack of memory on her makeup girl. Then there’s the young male lead’s ill-fated love for Jacqueline Bisset; she is happily married to a doctor, but unwisely extends her sympathy to the youth, who repays her by very nearly destroying her marriage as well as himself. And all the time there is the movie to be made: Truffaut gives us a hilarious session with the “trained” cat, and shows us without making a point of it how snow is produced on a set, how stunt drivers survive car crashes, and how third-floor balconies can exist without buildings below them. The movie is just plain fun. Movie buffs will enjoy it like “Singin’ in the Rain” (that perfect musical about the birth of talkies), but you don’t have to be a movie buff to like it. Truffaut knows and loves the movies so much he’s infectious; one of “Day for Night’s” best scenes is a dream in which the adult director remembers himself, as a little boy, slinking down a darkened street to steal a still from “Citizen Kane” from in front of a theater. We know who the little boy grew up to be, and that explains everything to us about how he feels now.